Chlorine and sweat. The smell is overpowering, and for a moment I feel like I might heave. 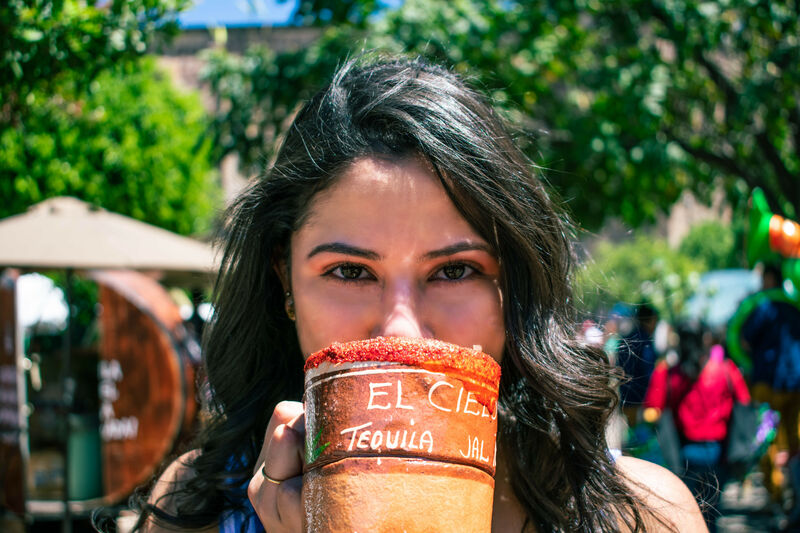 I take small sips, trying to steady my breath as a knot hardens in my stomach. 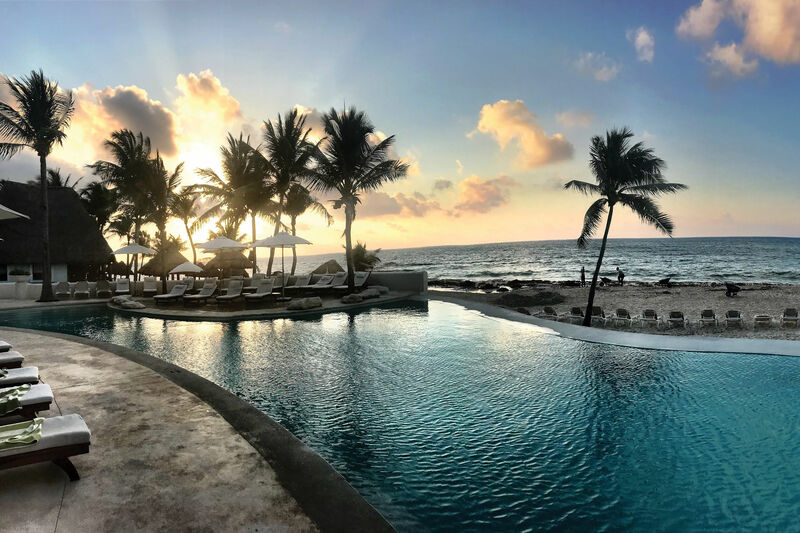 Below me, or rather, us—five other men are stuffed inside this metal box the size of a little kid’s bedroom—is a large pool, 11 feet from top to bottom. We are about to be dropped inside that pool and violently spun upside down. My instructor has yanked my seatbelt tight enough to squash my bladder, leaving me to wonder whether survival will require a Houdini-esque escape of which I am utterly incapable. To make matters worse, I’m weighed down by a baggy linen jumpsuit that adds an extra 20 pounds when wet, a pair of Crocs, and a helmet so tight it has my head throbbing in pain. Pedro, a former Army combat medic who works as an instructor at Falck Safety Services, says panic is a student’s chief enemy in the water. We are in a large garage at Falck Safety Services just off Richey Road in North Houston, approaching the final hour of Helicopter Underwater Escape Training (HUET). Next up is the course’s final challenge: Six straight dunks in the METS Model 5, a high-tech helicopter crash simulator that is as much a test of psychological fortitude as physical prowess. Failure to reach the surface will result in more dunks and more torture. 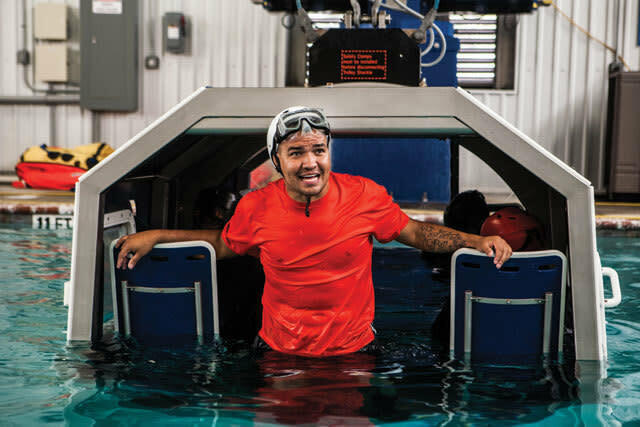 Calmly escaping the simulator will result in an “Offshore Water Survival” certificate, a novelty for a journalist like me but a non-negotiable for anyone—including thousands of Houstonians—who plans to set foot on an offshore rig. From the outside, the simulator isn’t much to look at. Were it not ominously suspended above the pool, the METS 5 would look more like a multiplayer video game at Dave & Busters than a sophisticated vehicle designed to recreate an offshore rig worker’s worst nightmare. 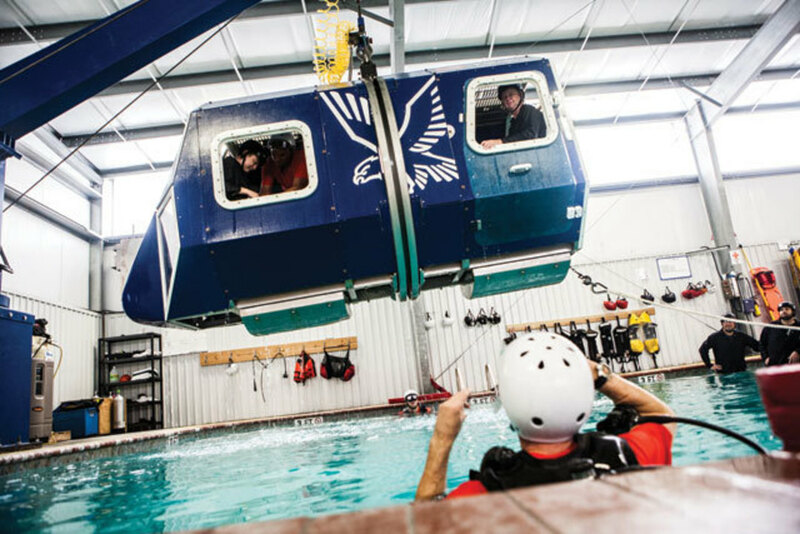 Even in action, the clunky-looking fuselage, which seats four students and two instructors, appears to move in slow motion as it descends from a 20-foot crane before gently submerging in the water and rolling on its side like a giant blue dog exposing its belly. It’s only one of many such contraptions the world over. It’s estimated that as many as half a million people undergo HUET training each year in cities all over the world. 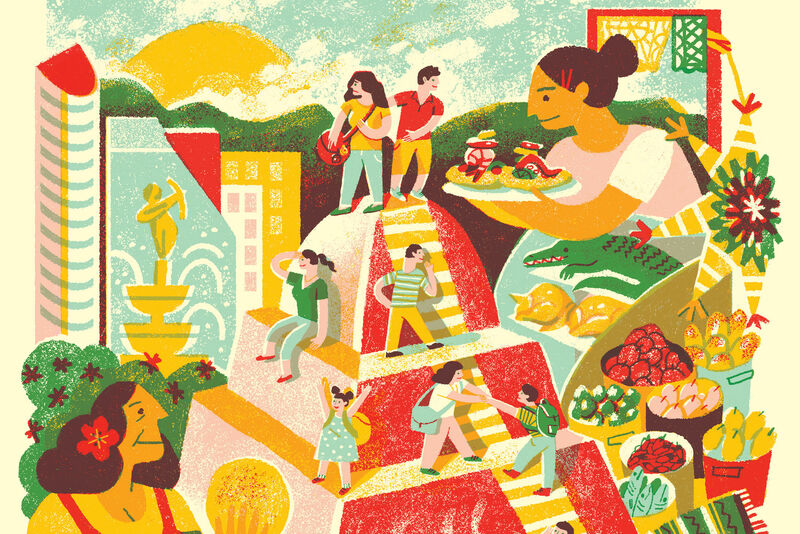 Wherever there is an oil and gas presence—be it Rio de Janeiro, Lagos or Bangkok—you will find these machines, of which there are more than 30 varieties. They range from replicas that are indistinguishable from actual helicopters to lawn chairs surrounded by PVC tubing and tossed in a pool. The key to escaping any simulator, and perhaps a real-life helicopter crash, is actually rather simple: don’t panic. That’s easier said than done for someone like me, who is given to occasional panic attacks in elevators, atop tall buildings, and on airplanes. Perhaps that’s why I’ve relegated myself to the class’s final group, shuffling to the back of the line over and over again in hopes of quelling my anxiety before entering the water. Hours ago I was sitting safely in a classroom, surrounded by two dozen middle-aged rig workers, all of whom look like hardened versions of Cliff Claven, the postman from Cheers. Pedro, lead instructor of the one-day, eight-hour class, warned me then that once inside the chopper I’d feel precisely as I now do. A 35-year-old former combat medic, Pedro has the gruff, booming voice of a drill sergeant and a “Protected By The Bill of Rights” tattoo crawling down his left forearm. Also, he survived two helicopter crashes—or “ditches” as insiders call them—during his time in the Army. In other words, when Pedro talks, people listen. So when he told us we could expect to panic while inside the METS 5, I knew we would. Panic is not, as you might imagine, an unusual reaction. But if my class’s members were similarly nervous, they never let on, hardly surprising when you consider that the 20 men and one woman had spent their careers working in the middle of the ocean. In general, students range from their mid-20s to their mid-50s, most of them blue-collar family men in the later stages of their careers. In my case, there was an overrepresentation of beer bellies and graying heads in the room and I couldn’t help but wonder if any of us, regardless of experience, would be particularly adept in the water. 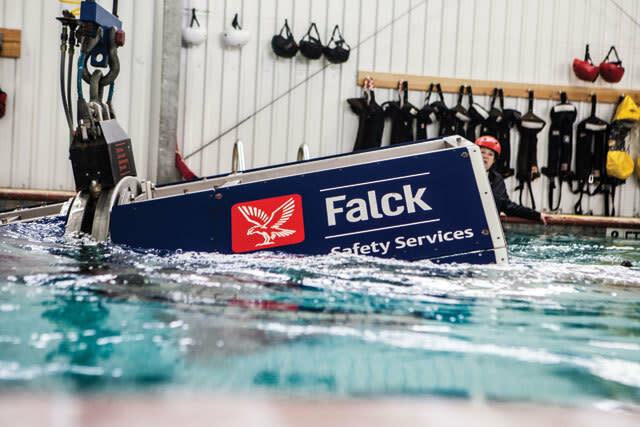 Students are briefed on simulator safety at Falck Safety Services before entering the pool. When you hear that the fatality rate for oil and gas workers onshore and offshore is seven times higher than that for all US workers, you probably think of exploding rigs, deadly chemicals, and falling pipes. But according to the Centers for Disease Control, the greatest danger they face is getting to and from work. In a report released in April, the agency named death by helicopter as the leading cause of industrial accidents for oil and gas workers. Helicopter accidents, the report noted, accounted for 49 of 128 fatalities between 2003 and 2010. In January of 2009 a Sikorsky S-76C++, a sophisticated, medium-sized, dual engine chopper carrying seven passengers lifted off from a heliport in Amelia, Louisiana, bound for an oil platform 55 miles off the state’s coast. 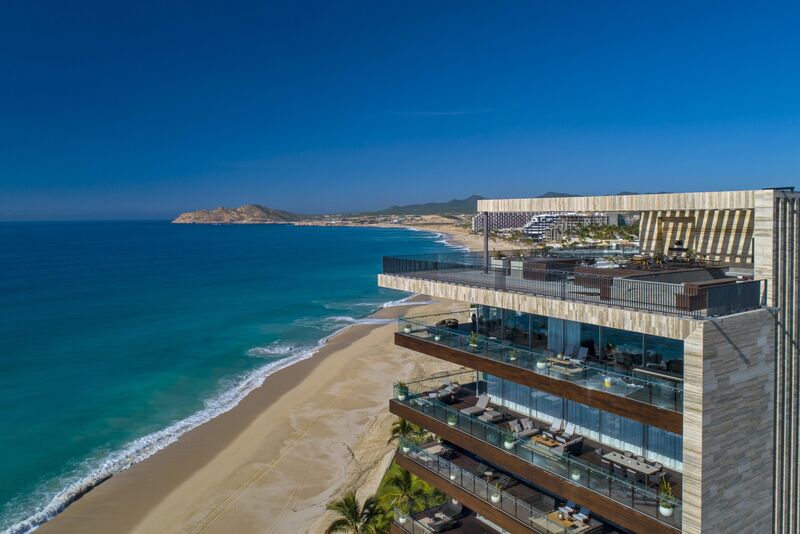 The weather was warm and the visibility good, but seven minutes after takeoff, the helicopter company’s satellite-based tracking system failed to register the aircraft. Shortly afterward, the Air Force picked up a distress signal, and rescuers eventually found the chopper partially submerged in a swamp near Morgan City. Only one person survived. Based on a DNA swab of the pilot-side windscreen, the culprit was determined to be a single hawk crashing through the window as the chopper sped along at 160 miles per hour, 700 feet from the ground. Crashes due to bird strikes are unusual, but not crashes themselves, at least not in the oil industry. Since 1984, there have been, on average, 8.3 accidents per year in the Gulf of Mexico alone, most of them engine-related, according to the Helicopter Safety Advisory Conference (HSAC), a cooperative that lobbies for safer practices. This year, two choppers have crashed in the Gulf, the first due to engine failure south of New Orleans on August 13; the second, on October 9, also south of New Orleans, is still being investigated. Meanwhile, oil and gas exploration continues to expand further out into the Gulf, and more and more deep water drilling stations are being built there. The result, of course, is longer helicopter rides and a greater potential for problems, including running out of fuel. It’s also a boon for the Gulf-based helicopter transport industry, which operates about 2,400 flights a day, according to HSAC. Over the last decade, experts say, the number of accidents has gradually declined thanks to upgrades in technology, maintenance, and training, as well as oil and gas companies turning to larger, dual engine aircrafts with multiple pilots. The difference, Fontenot says, comes down to risk. If an engine fails or a pilot has an issue during flight, choppers with a backup of either one increase everyone’s chance of survival. Helicopter crash training predates that cultural shift by a few decades. It was first offered in the early 1980s, just as oil and gas exploration was pushing into more remote, hazardous seas. These days, every major oil company in the United States and Europe requires survival training for employees travelling offshore, and the certification must be repeated every four years. In helicopter crashes, 15 seconds elapse, on average, between the moment a passenger realizes something is wrong and the moment the aircraft hits the water. About 70 percent of them capsize immediately, leaving passengers only another 10 seconds to escape, after which cold water and a diminishing air supply make death a near certainty. Most of the 159 offshore personnel who have died in crashes since 2000 died by drowning, according to crash researcher Dr. Michael Taber, who spent nearly a decade teaching marine survival skills to offshore workers and the Canadian military. And drowning deaths suggest another culprit, one of immediate relevance to me as I hover over the water: panic. Taber has put together a list of more than 30 variables that impact survivability, everything from modes of exit to where a passenger is sitting, from upper body strength to pain tolerance. The only way to mitigate these factors, if only minimally, is to train in a good simulator, he says. The METS Model 5 simulates a semi-controlled helicopter crash in water. 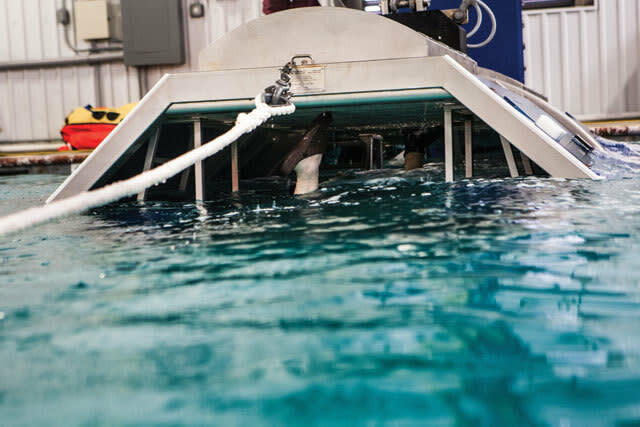 As the machine nears the water we will assume a brace position—heads bent toward knees and arms locked around ankles. Moments later, as the cabin begins to fill with water, trainees will then “locate,” i.e., place one hand on a seatbelt and the other on the window. These will serve as two important reference points when the simulator floods and turns upside-down. 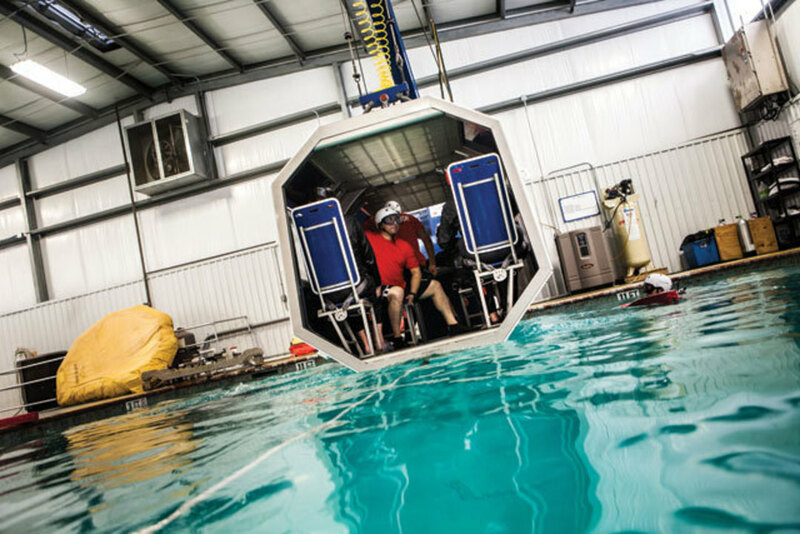 The simulator immerses students underwater before spinning upside down. This is when panic usually sets in, apparently. Not that we had any need to worry, he stressed. There would be two instructors inside the cabin and a pair of divers floating nearby, ready to swoop in and carry a frightened trainee to the surface. Two more instructors would watch the action from the side of the pool. Unfortunately, in moments of extreme panic, trainees often resist help, fighting back against their instructors as they cling to the simulator or flail about in confusion. A passenger’s foot can be seen inside the vehicle as he struggles to escape. After several hours of close observation, I’ve decided that the simulator, like any heightened physical challenge, does not build a person up—cliché alert—so much as reveal what is already inside them. And with the inevitable finally at hand, I can’t help but wonder what exactly resides inside me. Will I grow hysterical, attacking an instructor in a merciless struggle to flee this cramped contraption? Or in this room full of hard hat–wearing, monosyllabic men, will I be the only person who ends up screaming, as they say, like a girl? Or, worse, will I end up like the youngish guy a few minutes before, the one who unbuckled his seatbelt too early, lost his reference point, and swam in confusion toward the brightest light he could see? That light happened to be emanating from a thick, fiberglass window in the front of the simulator, one of the few on board that cannot be forced open. He remained lodged there, oxygen-deprived and helpless, until an instructor dragged him to the surface. In the real world, we have been told, you only get one shot. That guy, who arrived at the surface coughing and confused, blew his. A student gasps for breath after struggling to exit the simulator. “Brace for impact!” The instructor’s words ricochet off the cabin walls in a way that reminds me of how narrow they are, how claustrophobic I already feel. They say everything and nothing all at once—an instruction, but also a warning. I grip my seatbelt, press my hand against the window and try to follow directions as the fuselage tips onto its side. The water moves too fast to rush. It just appears, cold and strong. First on my legs, then my chest. I try to time my breath before slipping under, but it’s too late. The world is a swirl of bubbles and muffled, mechanical groans. I am upside down—I think—and still moving—I think—the water in my nose burning. On the surface, I can hold my breath for more than a minute without trouble. But now, as time seems to stretch, becoming a series of confusing fragments without clear end or beginning, I can think of only a single thing: my breath. Or the lack thereof. Per the instructors’ advice, my eyes are shut tight to avoid my becoming discombobulated, but I know there’s a window to my left that I’m supposed to force open by pressing my elbow against it. I am too impatient to press, so I swing my arm violently to the left, striking a surface that is flat and hard. Nothing happens. A nauseating electricity, that familiar prelude to panic, lights up somewhere in my gut. This is bad, I tell myself. The simulator is broken. I want to give into the panic, follow it down its own road of escape. Instead, I try again, unleashing a second, more aggressive strike. Then another. And another. Finally the wall gives ever so slightly. There is no holding back now, the desire for air dictating all decision-making. I open my eyes and see my escape route. With a final blow the window pops off, giving me clearance to unbuckle my seatbelt and twist my body so that I’m hovering in the simulator aware of nobody else but myself, utterly consumed by the single task of self-preservation. With my hands gripping the window, I pull myself forward with one powerful tug, sliding my body through the window with ease. I glide to the surface. Three other bleary-eyed heads pop above the surface gasping for air, old men and young, all leveled by the simulator. I am not the first, but also not the last. Under the water there is chaos, but here it is strangely quiet. No back-slapping or congratulations are in order as Pedro and his team do a head count and carefully look us over.